Don't hold your breath for the "Fight of the Century." The most anticipated fight to never happen won't happen again this year. Perhaps it never will. Ever. Floyd Mayweather Jr., one of the craftiest defensive boxers in the history of the sport, has decided not to risk his undefeated record against Manny Pacquiao, the relentless Filipino fighter who has won an unprecedented seven world championships in seven different weight classes. They have never met in the ring and the sport and industry of boxing desperately wanted a gigantic moneymaker and potentially gargantuan showdown. Fans demanded a fight. The rapper Snoop Dogg made a video pleading with the men to rumble in the ring. Michael Wilbon, a host on an ESPN commentary show, said Mayweather would be a "coward" if he didn't face Pacquiao. So, after about eight months of fits, feints, lawsuits and non-starters, the Filipino's promoter Bob Arum gave Mayweather an arbitrary two-week deadline to approve and sign the contract or he would start negotiating with other fighters. The deadline was midnight on Friday, July 16. The potential purse was $40 million  each. How could the fight not happen? It's never a fair fight when boxing people and logic go toe-to-toe: logic inevitably gets knocked to the canvas. Shortly after Friday passed into Saturday in Las Vegas, a weary Arum relayed the depressing news to a handful of bleary-eyed journalists. "Floyd, for whatever reason, didn't want to commit," Arum said. More accurately, he said, Mayweather had chosen to ignore the proposed contract and hadn't communicated with anyone. Or could it be that Mayweather just didn't like the unilateral nature Arum and the Pacquiao camp had taken the so-called negotiations? 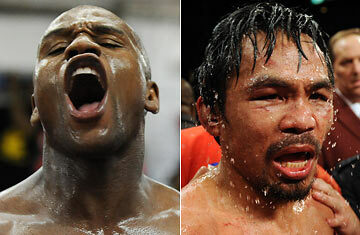 The two best boxers in the world have enough personality and back-story to transcend their blood sport. Pacquiao, who grew up in a cardboard shack, sings and cuts platinum-selling albums despite having a high-pitched squeal of a voice, was just elected to the Filipino Congress. Mayweather enjoys trash talking, hanging out with rap artists, and was a contestant on the reality show Dancing With the Stars. He calls himself "Money" and carries thousands of dollars of cash in his pockets. As good as they are in the ring, Pacquiao and Mayweather have proved to be laughably inept at actually holding a prize fight. And fans and boxing insiders are afraid the constant build-up and let-downs for the so-called "Fight of the Century" are black eyes for a sport that has seen its audience erode. Some say last night's announcement of a non-event may be the most embarrassing thing for the sport since Mike Tyson bit off Evander Holyfield's ear in a 1997 fight  though that was painful as well as shameful. This week's ridiculous Pacquiao-Mayweather non-starter is only the latest in a series. The men were supposed to go at each other earlier this year, but the fight negotiations broke down after Mayweather insisted on Olympic style random blood-testing. He said he was crusading for more stringent drug tests as a way to clean up the sweet science. But many people believe the blood-testing requirement was simply a way for him to duck the PacMan and preserve his perfect record, which Mayweather is supremely proud of. Pacquiao, who is very superstitious and claims to get weak when he gives blood close to a fight, refused Mayweather's testing regime and said that his opponent didn't have the right to create his own set of rules. Then the Filipino, who has never tested positive for using performance-enhancing drugs, sued Mayweather alleging that he made false and defamatory statements. Pacquiao's entourage started wearing T-shirts that said, "100 Percent God, No Steroids." Disgusted with each other, both men fought other opponents this spring, winning decisively in fights that weren't exactly spellbinders. Early this summer their representatives went to the negotiating table to see if they could line up a fight on November 13. A strict gag order was issued so insults weren't reproduced in the media. Arum worked through Ross Greenburg, the president of HBO Sports, who acted as a mediator and communicated with the Mayweather camp. Arum wouldn't reveal the exact terms, but he says the blood-testing issue was settled. Sources say that Pacquiao was willing to overcome his fear of blood testing so he could have a chance to beat-up his arch-nemesis. "We want to knock this bum out," says Freddie Roach, Pacquiao's trainer. When he shadow boxes in the gym, Pacquiao says he pretends he is fighting Mayweather. But Mayweather wouldn't play and didn't bother to call by the deadline set by Arum. In fact, the usually loquacious Mayweather probably wasn't even listening. (He didn't respond to phone calls from TIME as well.) He has good reasons for not getting into the weeds of a PR campaign right now. His uncle and trainer Roger Mayweather will go on trial early on Aug. 2 on charges of assaulting and choking a female boxer. The elder Mayweather has pleaded not guilty but could face up to 16 years in prison. He has always been a seminal influence on his nephew. "I understand Floyd's position, regarding Roger," said Arum. "I can understand Floyd delaying until there is a resolution of the Roger situation. I don't think you guys should be too harsh on Floyd." But when asked to speculate on why Mayweather wouldn't even bother to call him and explain his reasons for bowing out of the fight of the century? "I can't figure it out," Arum admitted. As a good showman, Arum used the occasion to talk about what's up next for Pacquiao. He said he would talk with his fighter to figure out who he wanted to meet next: the Mexican-American Antonio Margarito or a rematch with the Puerto Rican Miguel Cotto, whom he defeated in a spectacular battle in November 2009. If he fights Margarito, the bout will probably be held in Las Vegas or Monterrey, Mexico. If he fights Cotto, the fight will be held in Vegas or at Dallas' Cowboy Stadium. Arum said the Pacquiao-Mayweather fight could still happen this year if Mayweather suddenly emerged, but it would be more likely that it happens next year, if ever. But interest in the mega-fight might evaporate if the men drag it out much longer, testing the patience of beleaguered and disappearing boxing fans. And the greatest fight ever might just turn into the biggest farce in the sport's history.